The hyper spectral imaging system (HIS) involves collection and processing of data which is collected across an electromagnetic spectrum. Hyper spectral imaging systems enable obtaining spectrum for every pixel in a particular image or a sequence of images. Information provided by hyper spectral imaging systems has huge data access, which facilitates in the identification of an object. The hyper spectral imaging system are used to find shortwave infra-red (SWIR) spectrum region for providing in-depth information about the composition of a medicine. This is not possible with the help of normal or standard imaging processes. Considering benefits this technology provides, there is growing adoption of hyper spectral imaging system in the healthcare and medicine industry. The system assists in the diagnosis of numerous life-threatening diseases. Besides this, it is used in detecting oral medical complicacies without drilling or X-rays. While the global hyper spectral imaging system market is forecast to continue benefiting from benefits the system provides across diverse industrial verticals, the cost of acquiring these systems will remain a major bottleneck. Nevertheless, with technological innovations, reduction is price can be achieved. Price reduction will create lucrative opportunities for the market’s expansion in the near future, especially in agriculture and food processing industries. Given the scenario, Transparency Market Research (TMR) projects the global hyper spectral imaging system market to exhibit a CAGR of 8.4% between 2016 and 2024. At this pace, the market’s valuation will reach US$18.88 bn in 2024, from US$9.12 bn in 2015. Based on systems, PC Base, outdoor camera, airborne, and others constitute the key segments in the global hyper spectral imaging market. 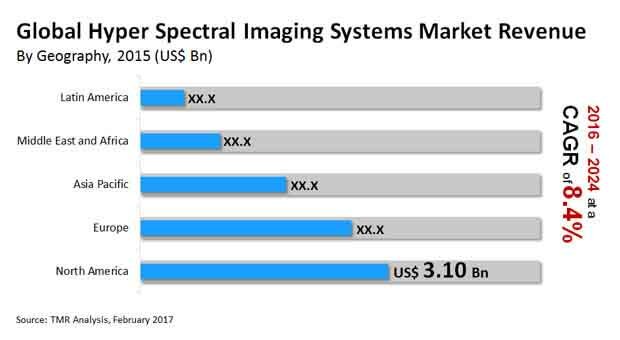 Of these, the outdoor hyper spectral imaging systems segment emerged dominant in 2015 with a valuation of US$1.61 bn. These systems can be portable tripod mounted or fixed and are considered more rugged than other types of HIS systems. The outdoor camera hyper spectral imaging systems cover 350 to 1700 nm spectral range and are widely preferred in field and defense applications. During the course of the forecast period, the segment is likely to exhibit robust growth. In terms of end-use industry, the global market has been segmented into military surveillance and homeland security, industrial, medical diagnostics, food processing, mineralogy, astronomy, and others. There is growing preference in usage of hyper spectral imaging systems in the medical diagnostic sector. This will create considerable opportunities for the hyper spectral imaging system market over the next few years. The hyper spectral imaging system enables early detection and treatment of life threatening medical conditions. Furthermore, the increasing application of hyper spectral imaging system in dentistry for the detection of tooth decay and other dental conditions will aid the market’s expansion in the coming years. Regionally, the global hyper spectral imaging system market can be broadly classified into North America, Asia Pacific, Europe, the Middle East and Africa, and Latin America. Among these regions, North America accounted for the largest market share in the market in 2015, followed by Europe. However, as per TMR Asia Pacific is expected to grow at the fastest rate over the forecast period. Hyper spectral imaging system is finding a wide range of application across a diverse sectors in Asia Pacific. Many leading companies are setting up their manufacturing facilities in the region due to availability of raw material and cheap labor in the region. This is expected to drive the hyper spectral imaging system market in Asia Pacific. Some of the key players in the hyper spectral imaging (HSI) systems market are Norsk Elektro Optikk (Norway), Corning Incorporated (U.S.), Applied Spectral Imaging, Inc. (U.S.), Specim Spectral Imaging Ltd. (Finland), Resonon Inc. (U.S.), Telops Inc. (Canada), Surface Optics Corporation (U.S.), Chemimage Corporation (U.S.), BaySpec Inc. (U.S.), Headwall Photonics, Inc. (U.S.), FLIR Systems (U.S.), Teledyne Technologies International Corp (U.S.), and Thermo Fisher Scientific (U.S.). The Hyper Spectral Imaging (HSI) system helps in detection and treatment of numerous life threatening diseases. The device would be used for dentistry for the detection and diagnosis of oral medical complicacies without X-rays and drilling. This enables detection of medical conditions without the patient actually going through any pain of drilling. Hyper spectral imaging system (HSI) is a non-contract, non-destructive procedure which finds application in a wide range of industries. The hyper spectral imaging system (HSI) involves collection and processing of data which is collected across an electromagnetic spectrum. The hyper spectral imaging system enables obtaining spectrum for every pixel in a particular image or a sequence of images. The hyper spectral imaging system are used to find SWIR (shortwave infrared) spectrum region for providing in depth information about the composition of a medicine. This is not possible with the help of normal or standard imaging processes. There is growing adoption of hyper spectral imaging system in the healthcare and medicine industry. Market dynamics include market drivers, restraints and opportunities and an exhaustive analysis of these factors are included in the report. Market dynamics are the distinct factors which influence the growth of the market and thus help to analyze the current trends in the global market. Therefore, the report provides a comprehensive study of the global Hyper Spectral Imaging System market and also offers the forecast of the market for the period from 2016-2024. Rising application of hyper spectral imaging system in surface vision and non-destructive testing is driving the growth of the growth of the market in developed countries. Hyper Spectral imaging system finds application in agriculture sector, eye care, food processing, mineralogy, surveillance and physics among others. The only factor restraining the usage of hyper spectral imaging system is the cost of acquiring these devices. Thus with technological innovation and reduction in the price of hyper spectral imaging systems in the near future is a key opportunity for the market growth especially in sectors like agriculture and food processing among others. The hyper spectral imaging systems by systems have been segmented into PC Base, outdoor camera, airborne and others. The hyper spectral imaging system by end use industry has been segmented into military surveillance and homeland security, industrial, medical diagnostics, food processing, mineralogy, astronomy and others. The global hyper spectral imaging system market by geography has been broadly bifurcated into North America, Asia Pacific, Europe, Middle East and Africa and Latin America. The market for hyper spectral imaging systems has been provided in (USD Billion) in terms of revenue as well as the CAGR for the forecast period of 2016 to 2024. The competitive profiling of the key players in the global hyper spectral imaging system market has been exhaustively covered under the scope of the report. Furthermore, the different business strategies which have been adopted by the leading players in the global market have been included in this report. In order to provide a detailed insight into the market dynamics of global hyper spectral imaging system market, the drivers and restraints affecting the industry are included in the study. Furthermore, market attractiveness analysis has also been provided in the report. Some of the key players in the hyper spectral imaging (HSI) systems market Norsk Elektro Optikk (Norway), Corning Incorporated (The U.S.) ,Applied Spectral Imaging, Inc. (The U.S.), Specim Spectral Imaging Ltd. (Finland), Resonon Inc. (The U.S.), Telops Inc. (Canada), Surface Optics Corporation (The U.S.), Chemimage Corporation (The U.S.), BaySpec Inc. (The U.S.), Headwall Photonics, Inc. (The U.S.), FLIR Systems (The U.S.), Teledyne Technologies International Corp (The U.S) and Thermo Fisher Scientific (The U.S.) among others.